Are Attorneys Committing a Crime by Helping Veterans? Are attorneys committing a crime by helping veterans get the disability benefits that they deserve? Some people seem to think so, but that is far from the truth! Today I had a riveting debate with a concerned individual who claimed that attorneys are committing a crime by charging fees on veterans' monthly disability benefits. We appreciate anyone who advocates for veterans and tries to educate them about their rights. However, as an experienced social security and veteran's disability attorney, it's my personal mission to arm veterans in need with the correct information about their rights, the disability process, how benefits work, and how attorney's fees can be charged. According to Federal Regulations, past due benefits are awarded to a veteran in one lump sum after they receive an increased rating decision. These benefits include all money that is owed from the time they originally applied for disability, to the time that they receive an increased rating. The VA will only authorize direct fee payments on this lump sum or "back pay" if the direct fee payment is 20% or less of the back pay. Attorneys are able to receive this payment from the VA unless a written contract directly states that the attorney is paid on a contingency basis, still for no more than 20% of the owed benefits. Contingency means that we don't get paid unless we successfully recover money in your case. The Coye Law Firm does not charge veterans on a monthly basis and does not receive any compensation unless we are successful in obtaining the veteran an increased rating, which results in an increase in their monthly disability payment. There are different veteran service organizations that file for benefits on behalf of veterans, but they are volunteers, not attorneys. Some of these organizations do a good job, but in my experience, attorneys are more seasoned with the law and the intricacies of the VA process that must be followed exactly. Who better to support you in court than a lawyer? These are just the basics of a disability system that is complex and changing. If you have any questions, my team and I are always available to answer them for you! 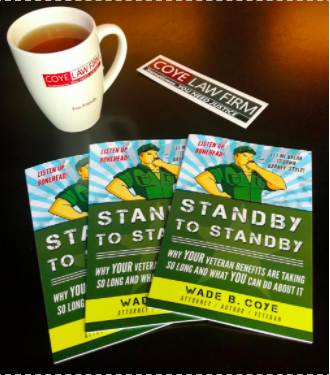 In addition, you can click here right now to request my free book, Standby to Standby, Why Your Veteran Benefits Are Taking So Long and What You Can Do About It. If you're a disabled veteran, the first step you should take is educating yourself about your rights. Request my book and you'll be squared away in no time!